What is Natrol Glucosamine Chondoitin MSM? 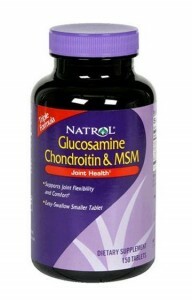 Natrol Glucosamine & Chondroitin with MSM is a joint supplement from Natrol, a diversified manufacturer of supplements. Natrol Glucosamine Chondoitin MSM has 1500mg glucosamine, 1200mg chondroitin, and 249mg MSM. We found no artificial dyes or coloring in Natrol Glucosamine Chondroitin MSM. Methylsulfonylmethane (MSM) Only has 249mg of MSM, lower than other supplements. MSM is a vital source of sulfur for protein and connective tissue synthesis.